I hope you had a nice weekend, we sure did. Our kitchen isn't quite done, but we got our new counter tops, sink and dishwasher installed and were able to take the plastic down between the kitchen and the rest of the house. YAY! My refrigerator is still in the dining room along with the rest of the kitchen items, but not having to wash dishes in the bathroom sink is a huge step in the right direction! Hopefully, I'll have photos to share early next week. Over the holiday break, my mom and Ruby and I went out to Oak Glen on a little day trip. 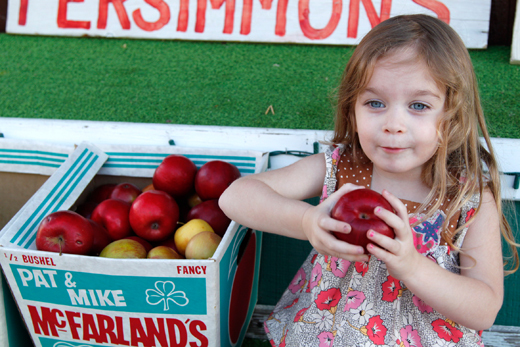 It's an area out in Yucaipa with apple orchards, farms and little shops. 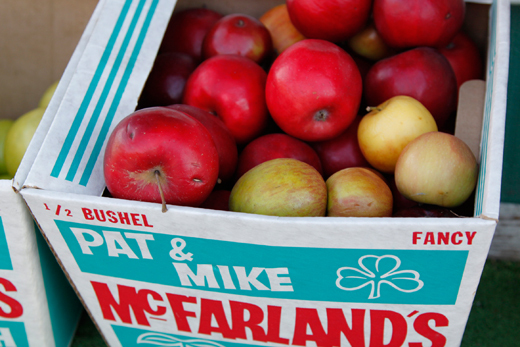 It's past season for apple picking, but they still had some apples and other fresh fruits and veggies for sale. We even found a little antique shop in very old house across from one of the fruit stands. Ruby wasn't wasting anytime, she went straight for a bright red apple. 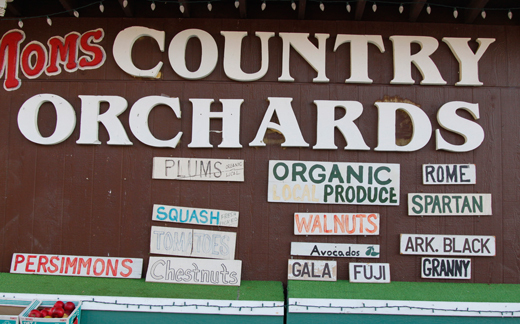 Mom's Country Orchards was my favorite place we stopped. They offered samples of everything they were selling, including: fruit, jam, salsa, cider, honey and about a million other things. I bought a bag of apples to make applesauce and some of the best produce I've had in a while: avocado, tomato and cucumber. 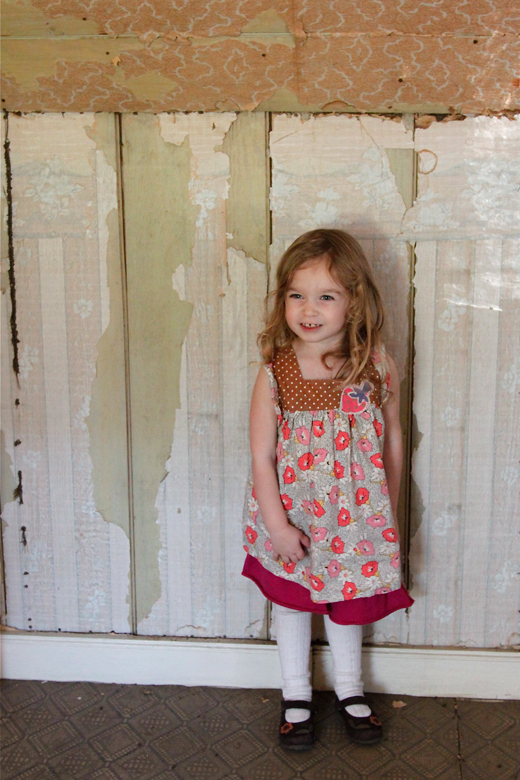 Here's Ruby in the upstairs room of this very old and dilapidated house-turned-antique-shop. I love the outfit she picked out for herself that day: dress by Misha Lulu, skirt from Target, tights and shoes were hand-me-downs. 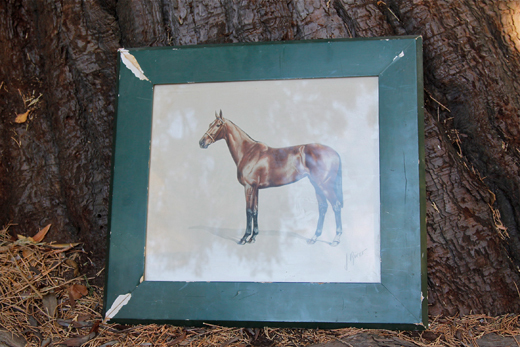 I picked up this old horse drawing from the 30's at the antique shop. I wasn't sure how I would make applesauce without a kitchen until the man at the orchard suggested I make it in the crockpot. So, when I got home, I put on a movie while I peeled and cut the apples. Then I just put them in crockpot, turned it on and when I came back I had delicious applesauce! I wrote up the simple recipe for you, in case you want to try it. One word of advice though, take the lemon rind out right after you cook it or in a few days it will taste like rotten lemon sauce. You can also add sugar if you'd like, but I like mine unsweetened. Hi Beth! I just love visiting Oak Glen and it's super close to where I live so I can make the trip pretty frequently. Looks like you had fun! I didn't even know about the antique store so I'll have to find it next time. 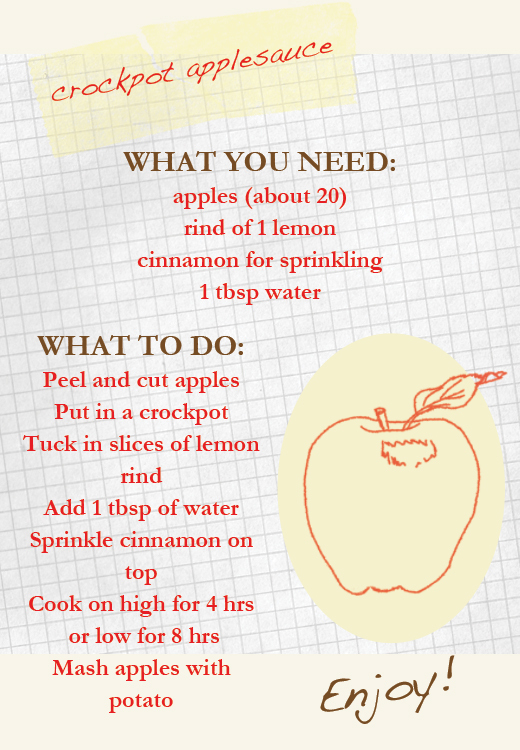 I want to try your applesauce recipe...sounds yummy! I Love Oak Glen! I went there around November, unfortunately there weren't any apples to pick, but it was fun sampling, eating those addicting mini donuts, and playing in the playground where that giant Yogi bear is.